Here’s a question for you: How many species of trout are produced in Arizona State fish hatcheries? If you said five, you’re right. Arizona hatcheries produce five species of trout for anglers to enjoy: rainbow, brown, brook, cutthroat, and Arizona’s native Apache trout, the State Fish. Fish culture, or aquaculture as it’s commonly referred to, has been in practice since 4,000 B.C. Nowadays, fish hatcheries are used to produce and grow fish for consumption (such as your local grocery store), ornamental use (aquarium or back-yard pond fish), recreation (angling), as well as conservation and recovery of species that have imperiled status. So where do the trout come from? Most trout in Arizona do not originally come from the stream, river or lake where you caught it, but rather it was stocked from a hatchery at some stage of its life. Natural trout reproduction in Arizona is extremely limited, yet angler demand is high. Trout cannot reproduce in lakes or ponds because they require cold clear-running perennial streams. Thus, the vast majority of trout caught in Arizona’s public waters originate from hatcheries. The Department hatcheries stock trout annually into public waters for anglers to enjoy. To accomplish this, the Department maintains six fish hatcheries within the State, each of which has a dedicated source of natural spring water. The hatchery fish are raised from eggs which are imported from other federal, state, or private hatcheries in the nation. Most fish are raised to catchable size before stocking, which is a targeted size of 9.5 inches. However, some lakes have abundant natural food and thus, are stocked with smaller fish such as fingerlings (3 inches) or sub-catchables (6 inches). Over time the smaller fish then grow to harvestable size within the lake. 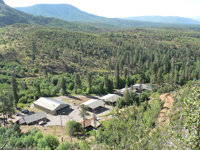 Most hatcheries have specific areas within Arizona where they stock, although there is some overlapping of waters. Five of these hatcheries, Page Springs, Canyon Creek, Tonto Creek, Silver Creek and Sterling Spring feature various trout species. The Bubbling Ponds Hatchery focuses on Arizona’s native fish such as razorback sucker, Colorado pikeminnow, and roundtail chub which is a native sportfish, but the hatchery also produces a small number of largemouth bass, bluegill, and channel catfish. Our smallest hatchery, Sterling Springs (which is not open to the public because of difficult access), specializes in hatching the trout eggs and raising them to fingerling size for transfer to Page Springs Hatchery. Raising trout is a public service supported not from income taxes, but exclusively from revenues generated by anglers under the “user pay, user benefit” system. When you buy a fishing pole or lure, a small portion of the cost goes to the U.S. Fish and Wildlife Service Sportfish Restoration Program. Your purchase of a fishing license is then used in combination with those Sportfish Restoration funds to pay for fish stocking efforts and keep the tradition of fishing alive. Please click on the links below to learn more about each fish hatchery, and hopefully you can bring the family to visit us sometime soon. Visitation hours are generally 8am to 4pm, except major holidays like Thanksgiving and Christmas.